Tough-looking with their cockscomb mohawks — the red one topping Ketch! ; the yellow one, HIRO-PON — the “silent-comedy” duo Gamarjobat (“Hello” in Georgian) are now well into a 31-stop tour that’s filling theaters around the country with whoops and rollicking laughter — as well as their own “language” of grunts, baby noises and crazy exclamations. Coming hot on the heels of 2010’s sell-out nationwide tour, this year’s show again includes a set of hilarious routines that sometimes flirt with the bawdy, followed by a narrative piece. This time, however, the pair are performing their first new story line for five years — a sci-fi mime drama. Innovation, though, has been a constant since pantomime artist Ketch! 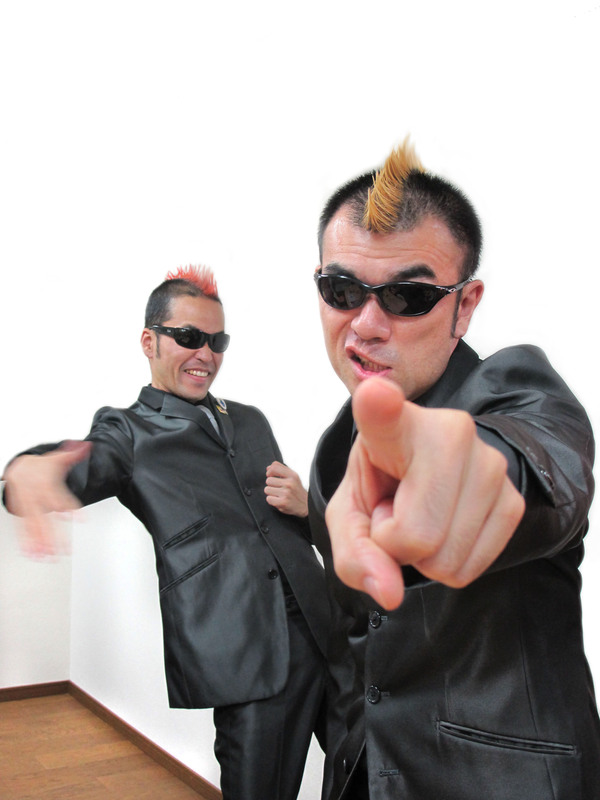 and theater performer HIRO-PON met in 1995 and, realizing they shared the same sense of humor, formed Gamarjobat in 1999. But as kindred spirits, it seems they are more complementary than identical. That yin-yang relationship has produced an on-stage chemistry that has struck a chord with audiences worldwide. 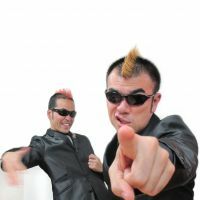 After forming Gamarjobat, they concentrated on performing at festivals in more than 20 countries, including tours of Britain and Europe, Thailand and Australia. In Britain, their absurdist, slapstick style proved particularly popular and they became the darlings of the top-rank Edinburgh Fringe Festival in Scotland after their first appearance in 2000, when they entertained to nonstop cheering and walked away with several top awards. Following many such overseas coups, Gamarjobat have mainly performed in Japan since the mid-naughties, all the while groping (sometimes literally) to explore new possibilities in the field of pantomime. Why did you choose to get mohawks? Ketch! : We tried several hairstyles, but when we tried these ridiculous ones — almost as a joke actually — everybody remembered us immediately. When we walked amid the hustle and bustle of Edinburgh and put on street performances there during the annual festival — which is the biggest arts festival in the world — our mohawks stood out. They had a dramatic impact, especially as we are Asians. We are a silent comedy group, so the first impression people get of us is important, it’s what makes them stop and watch. How did your lives change after your Edinburgh success? HIRO-PON: Well, after we’d won awards there, the BBC came along and made a 30-minute program titled “Ketch! and HIRO-PON Get It On,” which was screened in February 2009. We were lucky, because they made it just before the Lehman Shock and the big financial downturn. I’m not sure if they would have the budget now for a show spotlighting a foreign comedy duo. Back then, the Japanese media and entertainment worlds — which are so hidebound and insular in their ways — weren’t interested in us. Nobody seemed to realize how incredible it was that the BBC had made an original comedy program about just us. It was a harsh reality. In Japan, everybody rates comedians by how often they are on domestic TV, but we don’t believe TV is the best platform for every kind of comedy. Also, TV here tends to just have performers making funny comments on panel shows — not actually performing — so comedians only get around 30 seconds to get everyone laughing. It’s obvious your live audiences have no inhibitions about enjoying themselves. How do you create that mood? Ketch! : In the first part of the show, we do different routines and get the audience to take part, or we play a simple game with them. But it just depends on the audience — we instantly adjust our program to encourage them more or, sometimes, to calm them down and get them relaxed and ready for the silent-theater narrative piece that’s the second half of the show. Do you have any special episodes you recall from foreign tours? HIRO-PON: In 2009, we did three weeks at the New Victory Theater on central Broadway near 42nd Street, but we were a bit disappointed because it never got going or created a buzz like everywhere else. Ketch! : We usually don’t have any communication problems or feel any culture gap because we do silent comedy, and we believe pantomime is a universal art, so that was a bitter experience. Later, though, a New Yorker friend told me we would be better off performing at off-Broadway theaters, because the main Broadway theaters target tourists and so they’re not catering to the tastes of ordinary New Yorkers. A Japanese person who lives in New York also told me it was “phenomenal” that there were many more Americans at our shows than Japanese. She said that usually when Japanese artists or singers are in town, the audiences are full of expatriate Japanese. I was pleased to hear that. Last year, you started a new silent-theater company you named Gamarjobat Project to bring together mime artists and silent-comedy groups for joint performances. What was behind that idea? HIRO-PON: This is our 12th year as Gamarjobat and we thought we really ought to start trying to raise the profile of pantomime among the public. Many people have a fixed idea of mime, based on French mime master Marcel Marceau’s artistic performances, and they’re bored with that tradition. But we can provide new kinds of never-seen-before mimes that are hilariously exciting, cutting edge and modern. We want to reach a wider audience that will enjoy silent comedy more often. However, there’s a limit to what just us, Gamarjobat, can do by ourselves. So we are simply trying to bring about more mime performers, because we want pantomime to become more popular in Japan. If we can attract young performers who love pantomime, and if we share the same aims and work together, then the future of the mime world will be much brighter. Do you have any further ambitions or aspirations? Ketch! : We would like to make a silent film in Hollywood. As you know, silent movies once dominated the entertainment world, but now no commercial ones are being made. So, we would like to make a cool, 21st-century version of a silent film.